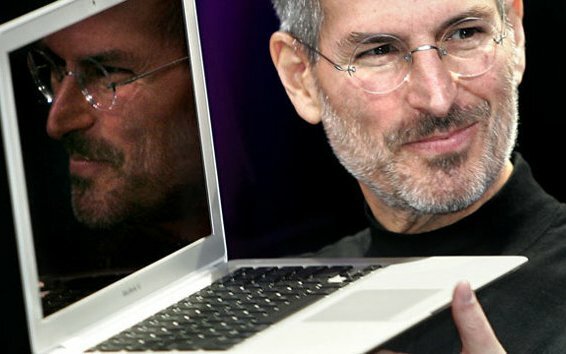 Steve Jobs, the mastermind behind Apple's iPhone, iPad, iPod, iMac and iTunes, has died. His family said in a statement that he died peacefully surrounded by family members, but didn't disclose where he died and what exactly killed him, though in recent years he had fought a form of pancreatic cancer and had a liver transplant. The billionaire innovator was 56. Steve was among the greatest of American innovators - brave enough to think differently, bold enough to believe he could change the world, and talented enough to do it. - President Obama. This is a man dt started biz at d age of 20yrs. Believed so much in himself. Rest in peace. U are indeed a genius. We need more of people like u in this world. Illuminati ppl hv come 4 him!! May the Soul of this great Revolutionary & Innovator rest in peace! iSad that the iPresident has died. He will always be the APPLE of my eyes. RIP to the Thomas Edison of the 21st century. LOL @ Anon 9:14,Illuminati LWKMD. "a great example of a leader with vision and driving force to attain it is Steve Jobs..."
There are 2 types of CEOs: leaders and managers. Steve Jobs was a leader and his model will be studied by many in generations to come. Pancreatic cancer has such a high mortality rate, and when he stepped down again in August, I knew the end was near. Thankful to have been alive in his time, I learned and I'm learning so much from him, and applying it to my life and career. Rest in peace. My only disappointment is I wish he knew Christ. THIS WAS A SIMPLE NON OSTENTATIOUS NO FRILLS MAN ALWAYS IN A BLACK TURTLE NECK, JEANS, AND TENNIS SHOES...A ONE OF A KIND TRAILBLAZER WHO CHANGED THE WORLD WITH THE MIND GOD ENDOWED HIM WITH...HE LIVED A SIMPLE GREEN LIFE AND WAS NOT A MEDIA HUGGER...HE EPITOMIZES WHAT GOD HAD IN MIND WHEN EACH PERSON WAS CREATED AND THAT IS TO ACHIEVE YOUR FULLEST POTENTIAL...MY HEARTFELT PRAYER IS THAT HE FOUND JESUS AND IS RESTING PEACEFULLY IN THE BOSSOM OF OUR DEAR LORD...AMEN!!! Good man that has contributed to humankind tru his innovative products unlike our leaders that leave lizard and cobweb occupied mansions allover the world and money in international bank vaults. R I P jare. One of the greatest innovator of his generation. ADIEU Steve Jobs. This really hurt me bad. I am just tired of cancer mehn.. Please please please, we all have to be accepting of the fact that not everyone is christian or muslim. Not everyone is going to share the same beliefs as yourself. I don't get this thing of wanting to impose your beliefs on other people. This is why we have this Alqaeda, boko haram madness today. The man was probably born a christian and converted to buddhism. We may never know, and quite frankly it is not and shouldn't be our business. May you Rest in perfect Peace Steve Jobs. "dith:I don't get this thing of wanting to impose your beliefs on other people" and what is this 'beliefs' if I may ask? It sad how people still fail to understand there's a clear difference between belief and truth. Accepting Jesus by becoming a new creation in Christ i.e born-again to get to heaven is not an individual belief but truth. Jesus has even shown some of his children(my sister included)this truth by giving them real visitations and revelations of both hell and heaven so that they can testify to their world about the reality of Heaven by accepting Jesus.Like others have mentioned if he only knew Christ(the way,truth and LIFE)salvation is guaranteed. But this should also urge us born again proud Christians, that until we check out of this earth we MUST never retire our mission of spreading the truth and Good news to all corners of the earth, in order to save the lives of those who are still blinded from the truth.If only Steve Jobs knew this truth of Jesus Christ, i can only pray he did.